Congratulations to WSTX Sports’ own Tommy Sullivan who was presented the Ryken Award at the junior end-of-year assembly. 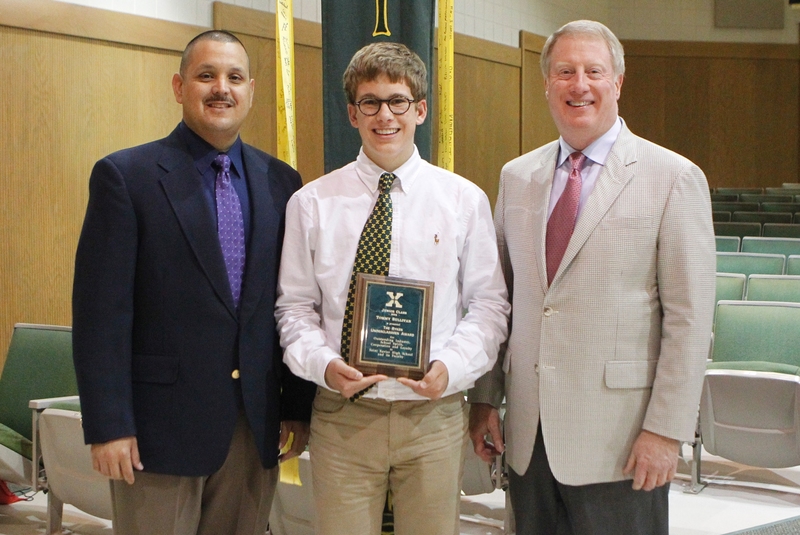 More than two hundred students were recognized in the categories of Spirit of St. X awards, Academic Excellence awards, and Excellence in Academics and Athletics awards. Additionally, one student was selected from each grade as the recipient of the Ryken Award. Sullivan, a junior, is a graduate of Holy Trinity who hit the ground running when he came to St. Xavier. As a freshman he quickly became a familiar face on WSTX as “the morning prayer guy.” From that beginning, he created a balancing act that has allowed him to be part of the St. X swim team, a key member of the morning news production, WSTX Sports Tiger Swimming Analyst, an integral member of the Student Activities Council, and a member of the National Honor Society. Tommy was also selected to be a member of the XBSS Leadership Retreat and a participant this summer in the prestigious Governor’s Scholar Program. Cole Schuhmann and Braidon Washburn also received Ryken Awards at their end-of-year assemblies as well. Posted on May 20, 2014, in Tiger Swimming and Diving, WSTX Sports and tagged Ryken Award. Bookmark the permalink. Leave a comment.